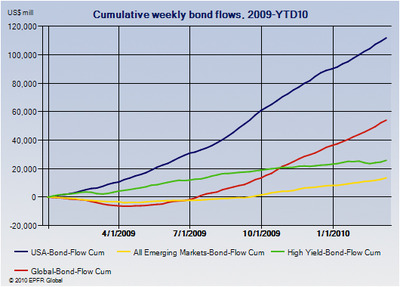 During the week ending March 10, US and Global Bond Funds extended their current inflow streaks to 62 and 47 straight weeks respectively, High Yield Bond Funds took in over $1 billion and YTD inflows into Emerging Markets Bond Funds moved over the $5 billion mark on the back of their biggest weekly inflow in over a decade. Flows into US Equity Funds were positive for a fourth straight week, their longest winning streak since 3Q08, as fresh money committed to Large and Mid Cap Funds offset net redemptions from Small Cap Funds. Outflows among the Small Cap Funds were confined to those with Growth and Blend styles, with Small Cap Value Funds having their best week in over two years.